As the inter-junction section of the mainline and the ramps, the expressway weaving area is one of the major bottlenecks within the urban expressway system. In addition to various behaviors of drivers, the acceleration lane length of expressway weaving area is generally short, which makes it more prone to trig traffic disorder and become a traffic accident blackspot. Increasing the acceleration lane length of expressway weaving area can provide larger buffer space for the merging process of vehicles. However, a longer length generally means a higher infrastructure investment. Consequently, an optimal length of acceleration lane is essential for the expressway road infrastructure development. 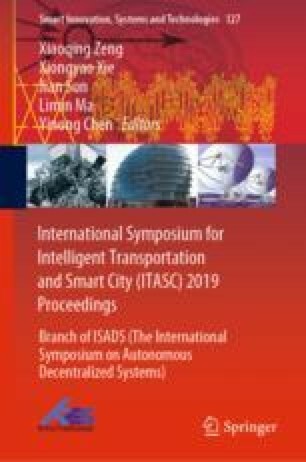 This paper uses the empirical survey data and a microscopic simulation system, called Traffic Parallel Simulation System (TPSS), as the simulation platform to build and verify the lane-changing model in expressway weaving area. By means of the developed weaving area simulation model, the impacts of various acceleration lane length on the traffic flow service levels are investigated, for obtaining the recommended value of acceleration lane length under different levels of services. This value further provides the guidelines for traffic management departments to formulate strategies and technical supports to relieve traffic congestions. Foundation item: Project (16ZDA048) supported by the National Social Science Foundation of China. The authors are thankful to the Shanxi Bei’an Fire Protection Technology Co., Ltd. for providing the necessary data and information in this study. The research was sponsored in part by the Projects (17DZ1204003, 17ZR1445500) supported by the Shanghai Science and Technology Committee (STCSM), Shanghai Municipal Government, and the Projects (201705-JD-C1085-072, 201705-JD-C1085-056) supported by the National Independent Innovation Demonstration Zone. Any opinions, findings, and conclusions or recommendations expressed in this paper are those of the authors and do not necessarily reflect the views of the sponsors.